Last night's Raw began with Paul Heyman and his client Brock Lesnar. Heyman spoke about Brock, John Cena and SummerSlam as Lesnar sported a variation of his shirt that said "Eat, Sleep, Conquer, John Cena". Heyman claims that he sells us on big events and to be honest, he does. If he was plugging the WWE Network for $9.99 all night, I wouldn't be as annoyed and that's purely because it's Heyman. Side note, I watched the "Lades and Gentlemen My Name is Paul Heyman" DVD and it's outstanding. Go see it if you haven't. Paul Heyman then rapped. Yes, he rapped like John Cena in 2003 and it was glorious. He says they're leaving to dinner and will be back by the end of the night. Money segment, purely because Heyman is gold. Corporate Kane made his triumphant return next. So, in his Kane career he has gone from masked to unmasked back to masked then corporate then demon and now corporate again. Whatever. Hopefully this keeps him away from WWE World Title matches now. He announces that Roman Reigns will be facing Rybaxel in a handicap match. I tweeted out that I enjoyed 2012 Ryback more than 2014 Reigns. Something about Reigns is just not clicking with me the way that it should. Ryback was actually doing his thing against Reigns but they would end up getting disqualified. Reigns would still beat up his opponents and cut another of the "same old, same old" promos as Renee Young interviews him. Randy Orton tells Uncle Kane that he will end Roman Reigns at SummerSlam but tonight he has to face Sheamus. This will be about the 277th time that we see this match so that'll be fun. Mr. Money in the Bank Seth Rollins went one on one with Rob Van Dam. I'm sure everybody agrees that in RVD's prime, this would be a bit of a dream match. However, it was just alright here tonight. They might as well call him Job Van Dam. I know, I know, I have the best jokes. Seth Rollins telegraphed this next part but it was still cool. You see, the ramp had big gifts and presents on them for Hulk Hogan's birthday. 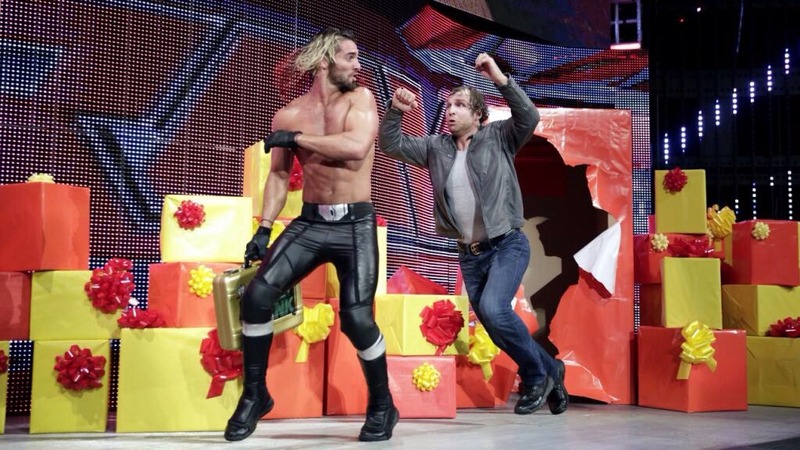 Dean Ambrose busts out from one of the gifts and attacks Seth Rollins, again getting one of, if not the biggest pop of the current roster. The best heel in the business, besides maybe Paul Heyman, joined us next in Stephanie McMahon. She introduced Daniel Bryan's therapist Megan, who says that while Daniel and Brie Bella are good people, Daniel had an affair with her. Oh man, this screamed Claire Lynch so bad that she was actually trending on Twitter last night. For those who don't know, just youtube search Claire Lynch TNA. She makes Brie Bella look like Meryl Streep. Brie comes out to confront her and slaps the girl before applying a not so great looking Yes Lock. Stephanie says they don't have to wait until SummerSlam and they should finish this tonight. This segment blew. There was no need to add this as it wasn't done well and came out poorly. Sometimes, less is more folks. Time for a WWE television rematch. I swear, we don't get enough of these. Enough with the sarcasm, Jack Swagger and Cesaro put on a good match here. They are two of the better workers on the roster and they were arguably the most talented tag team on the roster when they were together. I have to commend Cesaro for continuing to do his best in the ring considering his lack of push. Following the match, Zeb Colter goes all "We The People" but gets cut off by the Russian flag, Rusev and Lana. It was more of the same with these two, but unlike the Brie/Stephanie segment, it wasn't god awful, so it didn't hurt the build for SummerSlam. What followed was a sit down interview between Michael Cole, Bray Wyatt and Chris Jericho. Bray instantly throws out Cole, which was a wise decision. Bray's promo work is still pretty badass with his "I hate every damn thing that this planted has created. Including me." Good stuff. It was not bad, though the angles that it was shot in looked funny. Both men can go on the mic and it was acceptable but something about this feud isn't exciting. I'm not really looking forward to their match as the feud and buildup has been lackluster. Hopefully, it's the opposite of John Cena/Bray Wyatt, where the build was good but the matches sucked. I'm all for being surprised at SummerSlam. This promo could've been amazing if it was Jericho's straight man gimmick from 2008-2010. So, AJ Lee, my favorite Diva, would face Eva Marie, my second least favorite Diva in a non-title match. Paige, my second favorite Diva, appeared to skip around the ring and distract AJ after about 30 seconds. Eva rolled AJ up and won and I hate everything in life. This hurts more than R-Truth beating Bo Dallas. Paige apologizes to AJ in the form of a poem and it was rather enjoyable, just too similar to Heyman's rap from earlier. The best thing about this was a tie between Paige telling AJ that she loves her and AJ sitting CM Punk style in the middle of the ring. Then, after Paige skipped off, AJ beat the hell out of Eva to make all of us happy. John Cena is out now to discuss the SummerSlam match. He does a good job of selling it, but with Brock Lesnar and Paul Heyman in the midst of the longest dinner in history, it was just Cena. He can't captivate a crowd in the same way that Heyman can. He gets his points across and it's decent but nothing special. Things take a real turn for the worse as Brie Bella comes out for her match with Stephanie McMahon. Brie has the balls to wear kick pads like she's legit, but I do like that her gear is similar to Daniel Bryan's now. Stephanie appears and not in wrestling gear. She decides to extract some revenge and have Brie arrested just like she was a few weeks back. If Brie makes bail, she'll see her at SummerSlam. Again, not a great segment, but better than the stuff from earlier. THE ONE MAN BAND BABAY! Heath Slater, hot off of two straight wins, one against Seth Rollins last Monday and one as a member of Slater Gator on Main Event, comes out to face Dolph Ziggler. Thanks to a distraction from The Miz, Dolph chased him up the ramp and got counted out. THE SLATER WINNING STREAK CONTINUES! I enjoy Heath, but Dolph and AJ should've won going into SummerSlam, but now they both lose. Dolph gets some revenge on Heath post match but it doesn't make up for the loss. Even if it's just a countout loss. Time for the main event and it's never ending barrage of matches between Sheamus and Randy Orton. Back when Sheamus was the heel on Smackdown and Orton was the face, Orton had Sheamus' number, beating him constantly. I always said it was funny how Sheamus would beat John Cena, Cena owned Orton and Orton dominated Sheamus. Anyway, this was decent because both guys can work and Orton won. Sheamus has been a good United States Champion and him being off of SummerSlam baffles me. Nothing from Roman Reigns either who I expected to come out and brawl with Randy. Also of note, Randy now wears tape around his hand, which looks cool. The final segment of the night would be Hulk Hogan's birthday celebration. This should've been exclusive to the WWE Network post show as it did nothing to build SummerSlam. The roster was on the stage, while Jimmy Hart and MEAN BAH GAWD GENE were in the ring. The WWE, being experts in video packages, showed an awesome one for Hogan. Hogan thanked everyone but was cut off by Paul Orndorff, Ric Flair, Roddy Piper, Kevin Nash and Scott Hall. Hogan turned heel like it was 1996 as he ripped off the red and yellow to reveal an nWo shirt. Nash sung happy birthday but then BRRROOOCK LESSSNARRR interrupted and things got real. He said he was to beat up some citizens until John Cena ran down. Brock left, which was wise because I don't want them to touch until SummerSlam and the show closed. Overall, Raw gets was a disappointment again and earns a 5/10. On the Raw Backstage Pass, Hulk Hogan's cake was brought to the ring by SLATER GATOR, but they argue and the cake ends up on Titus O'Neill. He throws cake at Slater and this was strange. They bring out a second cake with candles that said 9.99! I can't make this up. Hogan thanks everyone. There was a special on Brock Lesnar and John Cena that aired on the WWE Network following this, but I wasn't able to catch it. I plan on watching it within the next few days and may do a short review for everyone.